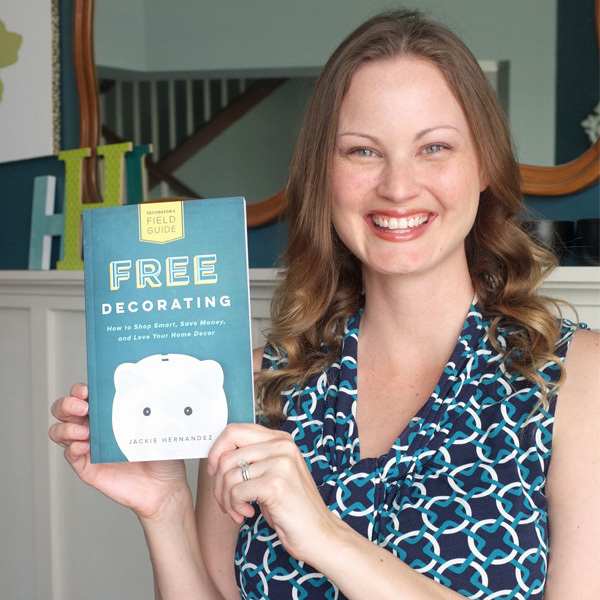 At the beginning of my 31 days of interior styling, I shared the top 10 styling mistakes to avoid and confessed which ones I was making. Hi, my name is Jackie, and I have a matching bedroom set. Thankfully we have a non-matching upholstered headboard, but the two night stands, two dressers, and the mirror over the long dresser are one matchy-matchy set. I am working to break up all the matchiness without replacing all my furniture. 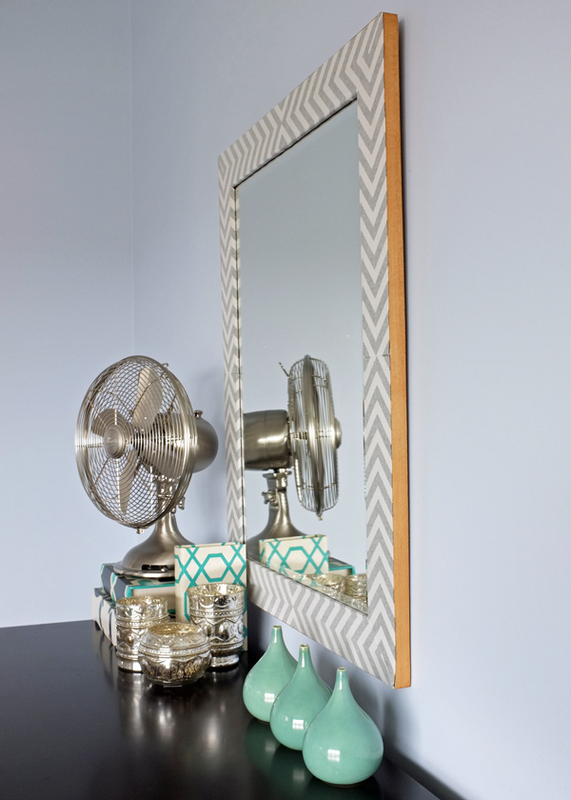 My first step is to take down the matching mirror and replace it with this new DIY version I made for $7. 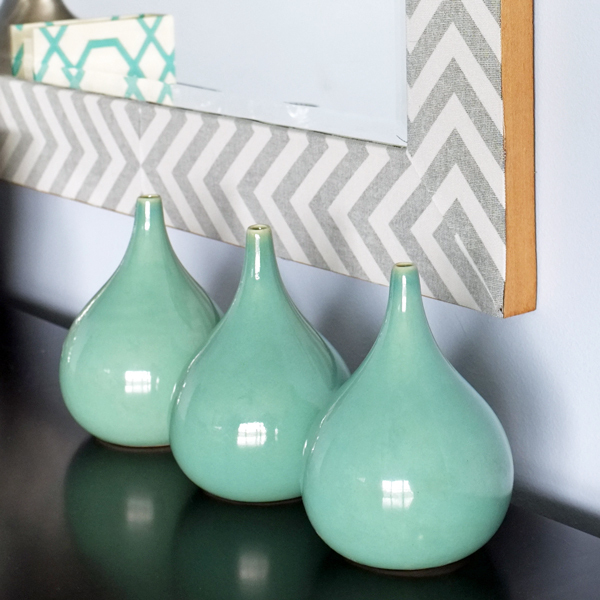 Oh yes, you read that right…this super awesome mirror was $7. Besides being cheap, it breaks up all the matchiness in the bedroom and adds a bold dose of pattern and personality. I am in LOVE with it. 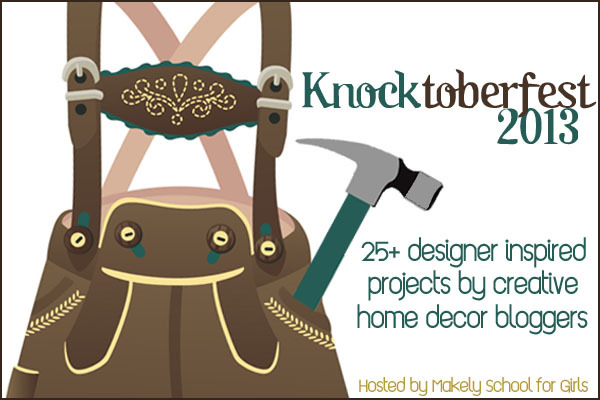 The challenge was simple; share a knockoff project inspired by a favorite designer or store. 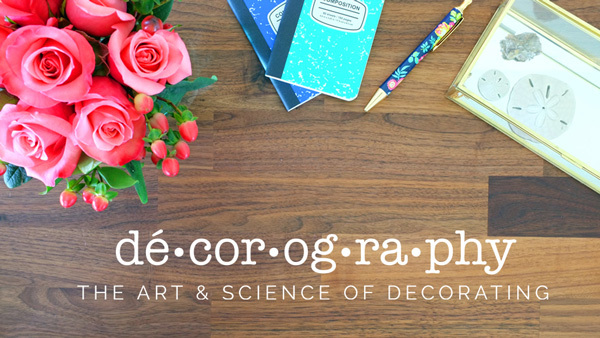 I scoured my fave sources for inspiration. I wanted to find the most amazing thing to knockoff. Of course, me always making things harder than they need to be, my eyes landed on this gorgeous $300 herringbone mirror. I though to myself, that would be one amazing knock off, if I can pull it off. 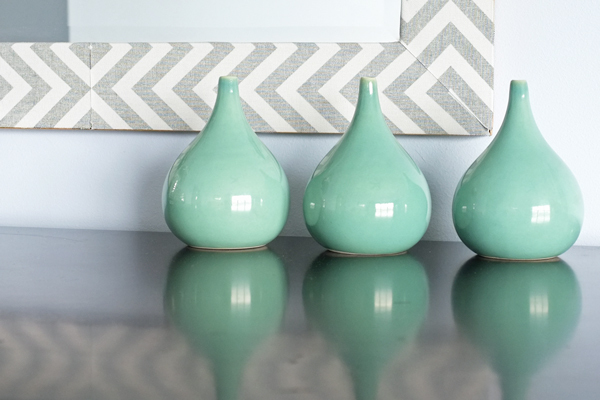 My mind began whizzing with a million ways to copy the faux bone inlay pattern…tiles, paint, paper. My head was dizzy with visions of trying to recreate the perfect herringbone pattern. Against all sense, amidst my confusion I started sharing my plan…my half-baked, I-am-not-sure-this-will-turn-out-plan. I should probably keep things to myself more, because mid-project planning I come off crazy and rambling. After hearing my plan, how much I loved the graphic pattern of the mirror, and the 187 different ways I was considering my faux tiling approach, my hubby sweetly reigned me back in. 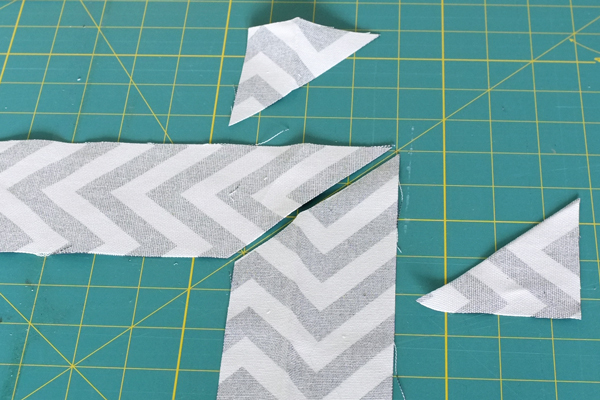 He asked why I wasn’t using fabric…chevron fabric to get the graphic pattern. Man, I married a genius! 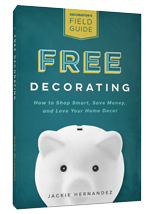 While I was distracted by the tiled effect, all my hubby heard was me professing my love for the awesome graphic pattern…that was the element I wanted to knockoff. Off to the fabric store I went looking for the perfect charcoal and white chevron or striped fabric. All I could find was black and white chevron. Even though the scale was perfect, I debated for way too long if I could love the high contrast black and white. Was it too far gone from my inspiration?! Again, here I was making it more complicated than it needed to be. I started twisting the fabric around to get the pattern lined up the way it would look on the mirror, when I realized the reverse side of the fabric was perfect. 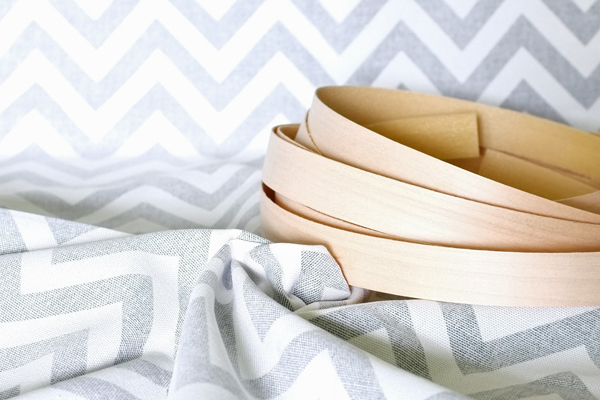 A softer gray and white pattern! 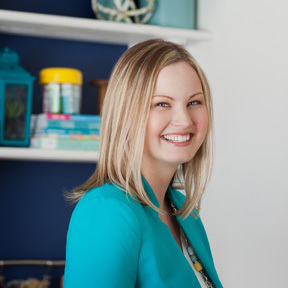 The one thing I did right from the beginning was choose a project that would help me reuse something I already had. 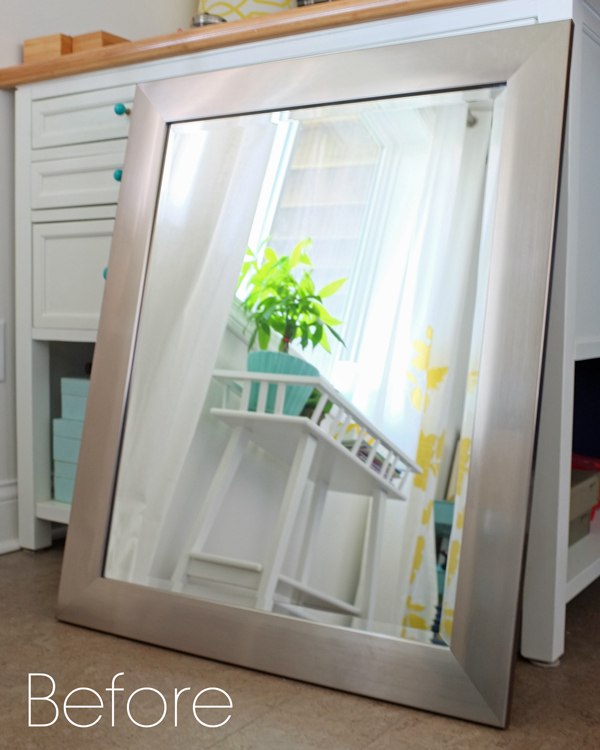 After some recent redecorating in my son’s room, this wide silver framed mirror was floating around homeless. The flat wide frame was perfect for my project. I also had a roll of wood veneer perfect for covering the outer edge of the frame. I scored the eight foot roll of 2″ wide veneer at Goodwill for only .49 cents. Add that to my free mirror and $6.50 worth of fabric and my knock-off cost a whopping $7! 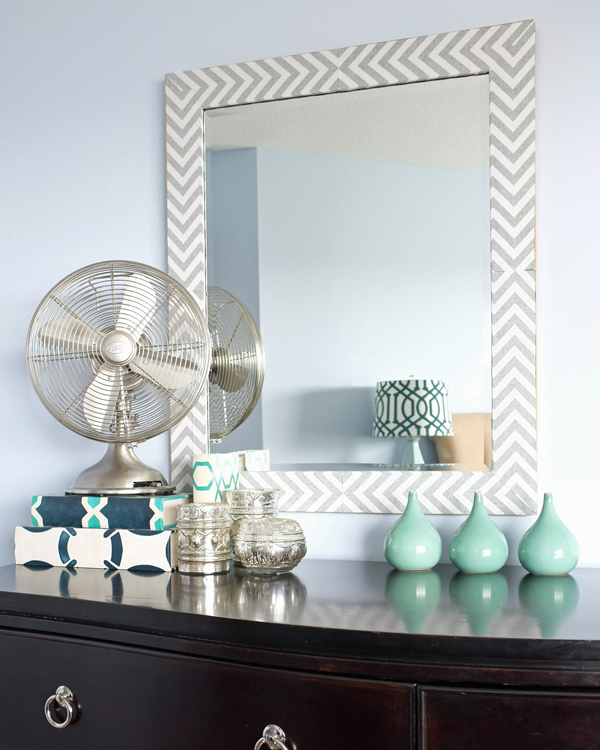 Even if you had to buy a mirror, you could pull this off for under $60! I started the project by attaching my wood veneer to the outer edge of the mirror frame. Not confident the iron-on glue on the veneer would hold to the metal frame (it is meant for bonding wood to wood), I skipped the ironing and went straight for the E6000 glue. 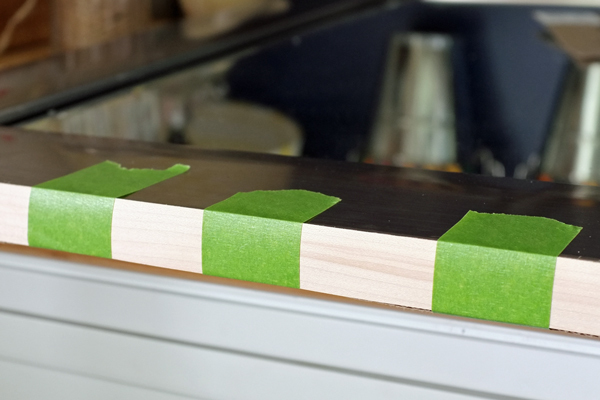 I used strips of painter’s tape to hold the veneer on while the glue dried. I wanted to deepen the wood tone of the veneer slightly to give it a warm glow. I stained it with Early American wood stain. I applied one coat with a rag and wiped it off immediately. 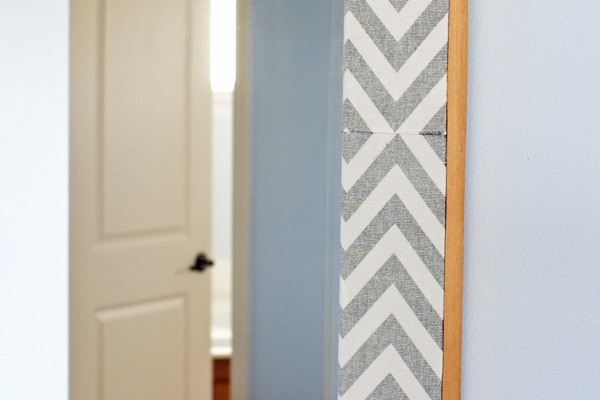 To recreate the graphic herringbone pattern, I cut chevron fabric into 8 strips to cover the face of the mirror frame. Notice on the inspiration mirror, the chevrons point toward the center of each side of the frame, creating an X in the middle. I started by cutting a strip slightly longer than one entire side of the frame. 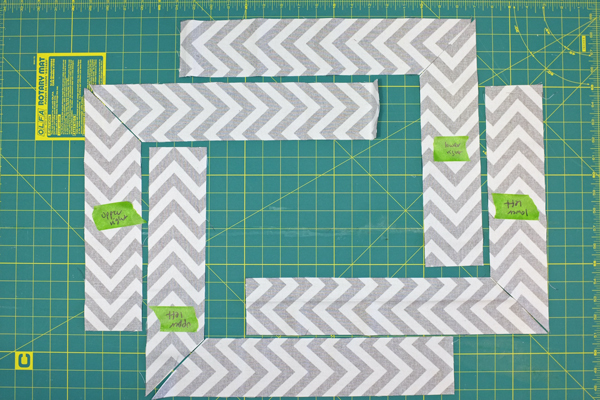 Then I cut that strip in half so I could point the chevrons toward each other. I lined up the two strips with the X on the center of the side, then I trimmed the excess fabric at the ends. I cut my strips wide enough to cover the face of the frame, about 3″, plus extra to wrap on the inside lip of the frame, about 1/4″. I mitered the strips where they met in the frame corners. To do this, I laid the strips on my cutting mat as they would go on the frame. The ends of the perpendicular strips overlapped. I used my quilt ruler and rotary blade, to cut diagonally across the corner of the two strips of fabric. The result is a perfect miter with the patterns matching up. The last step was to glue the fabric on the frame. I used one of my favorite craft glues, Elmer’s Permanent Spray Adhesive, to adhere the fabric. I sprayed the back of each fabric piece and then pressed it in place. I used my fingers to smooth out the fabric and make sure there were no bubbles or wrinkles. I can’t even explain what a dramatic difference this mirror makes in our bedroom. It definitely helps break up the matching furniture set. But, more than that it adds so much personality. It is no secret that I love a bold graphic pattern. I love seeing this mirror, which is on the wall opposite my bed, first thing in the morning and last thing before I close my eyes at night. You might be wondering if this looks lop-sided with the mirror off to one side of the dresser. Don’t worry, some new DIY art is going up over the other side of the dresser. 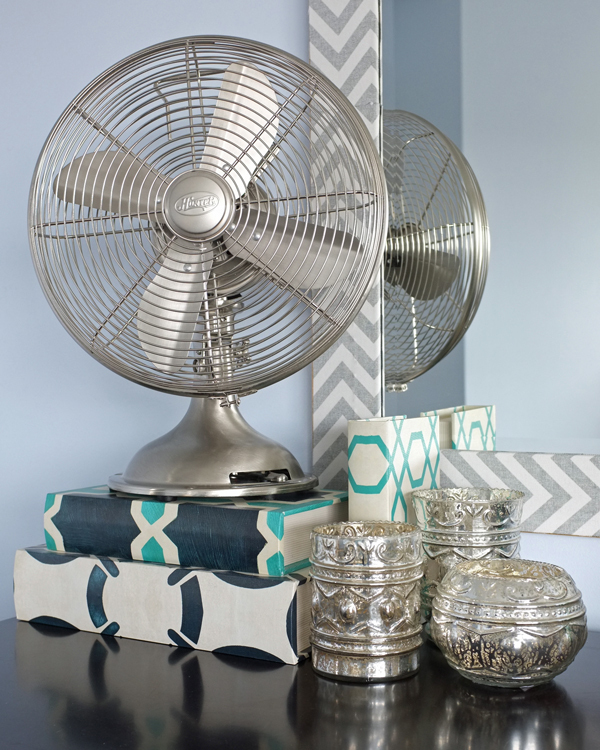 Check out whole look and how I styled the dresser top here. 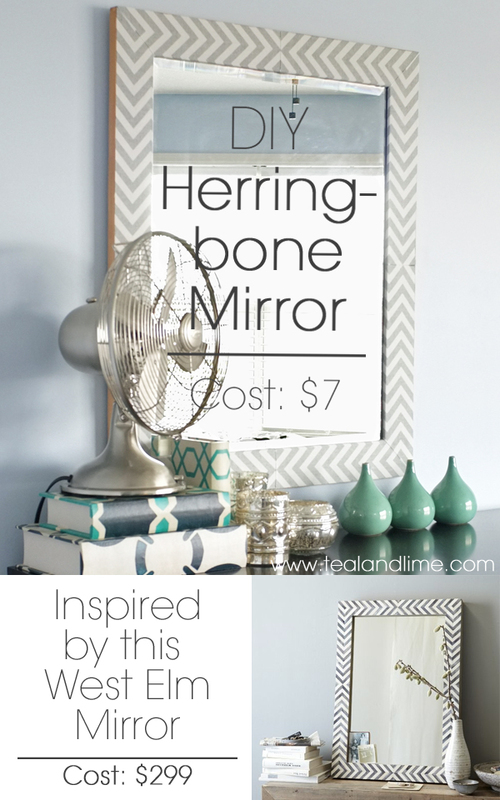 Love, love, love this mirror – and too funny that it’s the back side of the fabric… $7 price tag – SCORE!!! Your mirror looks fantastic – I love your creativity! Does the spray adhesive prevent the fabric from fraying? Thanks, Janet. The spray prevents fraying where the two pieces are joined on the face of the mirror, but not as much at the edges. But it has been holding up well. Since it won’t really be touched, I don’t think it will be a problem. This came out beautiful, you did a fantastic job :) I love it! Sarah, Yay! I would love to see pictures when your are done! Your mirror is amazing. I am in love with it. Awesome job! Thanks, Jen. Right back at you! I absolutely LOVE it Jackie! What a great, inexpensive knock-off! Thanks Diana. Hope you got my email last night, too. I think I fell asleep dreaming about those amazing fabrics for your girls. Oh how clever! 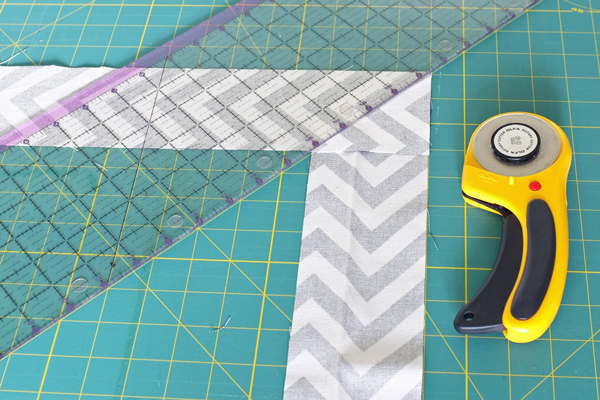 Love your fabric trick! The mirror is a show stopper and is absolutely gorgeous! Love the mirror. Did you buy your books with that design or is that wrapping paper? Thanks Jenny! The books are actually book boxes that I found at HomeGoods. Online the set goes for over $50, but I got all three for about $24. LOVE it! It looks amazing, Jackie! I absolutely love this knockoff!!! What a smart idea to use fabric! My parents in law have a mirror that has that same affect, painted on it, and they don’t love the color anymore (yellow & white). They asked me to do something with it and now my mind is swirling with visions of fabrics!! So smart and I love that you also added the veneer to the sides for a really finished look!! Awesome!! Lisa, fabric is the way to go. This was so easy. You might want to prime over the color underneath first. I’ve been eyeballing that mirror at West Elm for a bit. this is the perfect way project. Love it! On another note: I also love your pretty wrapped book boxes. Thank you Misty. I found those fab book boxes at HomeGoods! I NEED this NOW! This is an amazing knock off! Well done! Thank you Heather. You need to make one…it would look awesome in your house! love this! 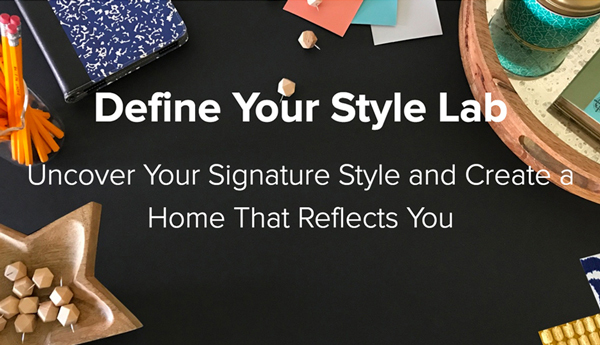 Great job – love your styling too! That is a wonderful makeover and an even better knockoff. Love that you have used fabric and not paint! Great job. AMAZING. And simple too considering you used fabric. At first I thought you used paint! Beautiful work. So clever and SO pretty, Jackie! I love it! This is so cool!! I thought you painted it; I never would’ve guessed you used fabric! 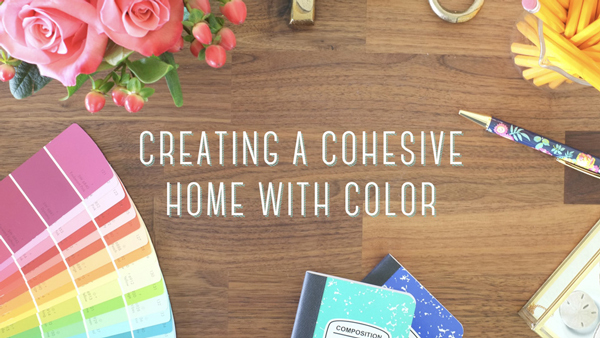 My husband & I both have a habit of making projects more complicated than they need to be; thankfully, we still manage to balance each other out! Absolutely awesome Jackie! I have a big mirror I want to redo and was thinking paint…but now I’m thinking fabric! Thanks for sharing this fab idea!